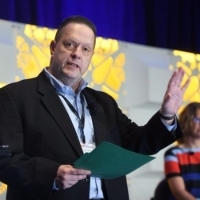 As a highly innovative and results-oriented business leader, Ron Trznadel has built a successful career leading event and media sales teams in robotics, pharma, telcom, and health care technology. Currently serving as Event Director for the RoboBusiness/Robotics Business Review team for the past three years, Ron has been responsible for growing the number of participating vendor companies representing the full eco-system of the industry through events, newsletters, analysis, and industry white papers. Past media and event experience includes leading the business development growth for the World Healthcare Congress Group and the LifeSciences/Drug Discovery Team. As a Director of Membership for the Massachusetts High Technology Council, Ron doubled the size of the Council by adding 80 new high-tech firms to the group. He currently resides in Massachusetts with his wife and two children.